Controlling soil erosion is imperative for the health of coral reefs surrounding tropical islands like Guam and her northern neighbor Rota. Soil erosion and run-off result in sedimentation and suffocation of the complex organisms that make up a reef system. Soil scientist Dr. Mohammad Golabi has been monitoring water quality of Rota’s Talakhaya Watershed since the planting vetiver grass in eroding areas. “This watershed is located in an area containing steep slopes and experiences frequent wildfires in the dry season. Vetiver’s ability to tolerate high stress situations, adapt to a variety of conditions, develop a dense vertical root system, and powerful soil binding characteristics make it an ideal candidate for controlling soil erosion,” says Golabi. The scientific name for vetiver is Chrysopogon zizaniodes and the thick, stiff-stemmed cultivars are used for controlling soil erosion. 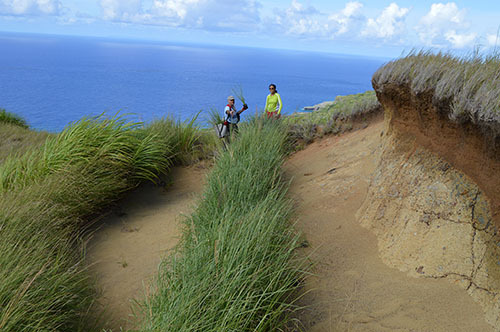 Researchers around the world have evaluated the application of vetiver grass and found it to be very effective when bioengineering technology is needed to stabilize soil on steep slopes like those in the Talakhaya. The plant’s spongy root system binds the soil beneath the plant to a depth of up to 3 meters forming a dense underground curtain that prevents gullying and tunneling. Once the hedge has been established, it can live up to 50 years and does not require further maintenance other than periodic trimming. Under certain circumstances thick hedges can be formed in one year, it generally takes two to three growing seasons to establish a hedge dense enough to withstand torrential rains and/or heavy storm events, and protect the shoreline from sedimentation. The analysis of the soil and water sampling from the areas of the watershed planted with vetiver grass will be compared with areas of watershed without any vetiver plantation to evaluate the environmental impact of the vetiver plantings on the watershed. 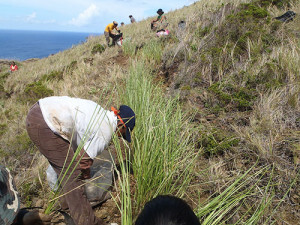 It is expected that the results of planting the new vegetation, especially vetiver grass, will show a positive impact on the environment especially the health of coral reefs in areas fed by the Talakhaya Watershed well as other marine life.